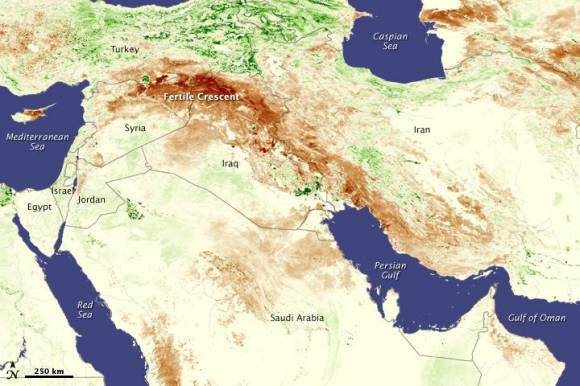 Climate change caused by human activity contributed to four years of record drought in Syria, and that drought helped spark Syria's civil war. A major new study in the journal Proceedings of the National Academy of Sciences examines climate change as a contributing factor to the 2011 uprising in Syria, connecting the dots from our greenhouse gas emissions to an international conflict that's killed 200,000 and displaced millions. The study echoes previous theories that the drought of 2006 to 2010, which wreaked havoc on agriculture and drove displaced farmers to urban areas, contributed to the unrest already at play in the region, and others that link rising temperatures to an increase in violence. "We're not saying the drought caused the war," cautioned study coauthor Richard Seager, a climate scientist at Columbia University's Lamont-Doherty Earth Observatory, in a statement. "We're saying that added to all the other stressors, it helped kick things over the threshold into open conflict. And a drought of that severity was made much more likely by the ongoing human-driven drying of that region." It also, experts say, makes a strong case for the role climate change played in increasing the length and severity of that drought: through higher-than-normal temperatures that dried out the soil and by indirectly weakening wind patterns that typically carry precipitation from the Mediterranean. Put together, the study makes a power argument for how climate change is already impacting us in real and frightening ways. And it lays to rest the false comparison some in the GOP have set up between climate change and ISIS: rather than arguing over whether one is scarier or more important to address than the other, it suggests, we should be focusing on the ways in which the two are intertwined, and bearing in mind the ways in which extreme environmental conditions can help push an already vulnerable region over the edge. It's a risk the U.S. military is already taking extremely seriously. The Pentagon, which has called climate change an “immediate threat” to national security, considers it to be a "threat multiplier": an underlying factor that exacerbate risks like food and water insecurity much as it works to exacerbate extreme weather conditions. It's difficult if not impossible to prove that climate change caused either. But as scientists turn their attention to the complex ways manmade climate change is transforming our world, its outsized influence is becoming impossible to ignore.